I have been getting this error for over 5 hours and I have ran out of ideas and guides. I am trying to install a web-application build by our developers on a Windows Server 2008. I have installed it plenty times at different customers, although not on a WS2008. 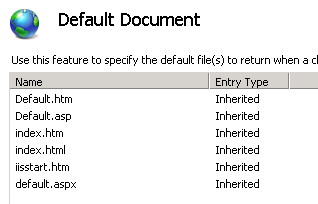 Secondly, I read that there might be a problem with the default documents. so I went to another customers server to check what I have there under the 'default document' button, and yes.. Exactly. the same. Now I have been checking some settings for the past few hours and I can't see anything, at all.. I downloaded .Net 4.5 Framework from the Microsoft website to check if the latest version of .Net is installed but I instantly get the message that the same or newer version is already installed. Please, if you have anything I can try, don't hesitate to comment. Browse other questions tagged windows-server-2008 iis-7 asp.net or ask your own question. Do I need to have the asp.net mvc framework to run my asp.net mvc apps on a web server? Why can't I get ASP.NET 4.0 to work on Windows Server 2003 R2?